when you’re in another country it’s always good to learn place names by what the locals call them. 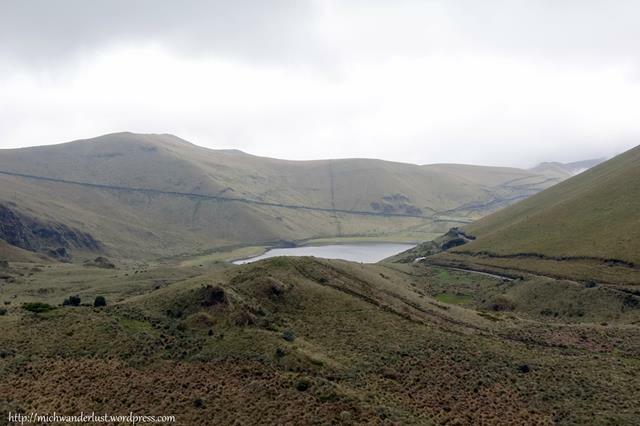 One of the reasons I stayed at Rose Cottage was its proximity to the Lagunas de Mojanda. The lagunas de Mojanda comprise 3 lakes: the “big lake”, the “little lake”, and the “black lake” (so called because its waters look black!). They’re located high in the páramo (Andean grasslands above the treeline) and is quite popular with Ecuadoreans (we saw quite a lot of cars), but not as popular with extranjeros (foreigners). Probably because there’s no way to get there using public transport! You have to get a taxi or arrange for some other private transport. We asked the hosteria if they could recommend a guide, and we ended up going with 2 employees who were familiar with the area as they had lived there all their lives. (They apparently moonlight as guides and drivers on top of their regular jobs!) That was quite fortunate for us as we saved a bit on transportation. A taxi there would cost about US$15 one way, but they charged us $25 for the round trip plus guiding services. I don’t recommend going without a guide, by the way. It’s not exactly a jungle so you can see where you’re going, but it’s so vast and remote that I shudder to think what would happen if you got lost. It’s cold in the day (about 10 – 15 degrees C), but gets even colder at night (it can drop to below freezing). Not somewhere you’d want to be without proper protection. We did see people camping there, but I personally prefer a warm bed! We saw only one other foreigner while we were there – she was with a local guide but panicking as she’d gotten separated from her mum and couldn’t find her. We’d been walking around for a few hours by that point, but hadn’t seen her mum or any other foreigner. I hope she found her! A timely reminder that if you’re in unfamiliar territory, don’t wander off by yourself. We parked by the side of the big lake (above), which affords an incredible view of the pristine landscape surrounding us. Here is one place humans haven’t touched too much (yet). We’re above the treeline here (it’s too cold for trees to grow, I think!) at an altitude of 3720m above sea level. So you don’t see trees – instead, the ground is covered with shrubs and paja (straw). 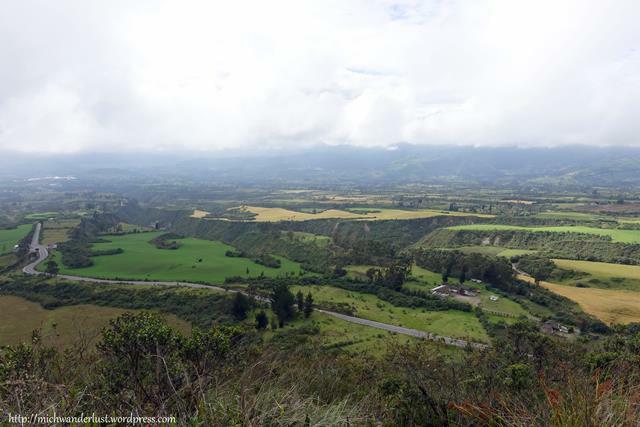 Some say that’s how the páramo got its name – from the ubiquitous straw. On the right looms the majestic Fuya Fuya volcano, standing at 4263m above sea level. (It’s inactive, don’t worry.) There’s a clear hiking trail up, although it involves going through waist-tall tufts of straw. Be warned: it’s very steep. You’re basically going straight up. And if you’re not acclimatised to the altitude yet, it’s going to be even tougher. We were fairly acclimatised, having spent the last few weeks at 2000m above sea level or above, so we thought we’d attempt it. We were on the clock, though: our guides / moonlighters had to be back at the hosteria by 1pm, and it was already past 10am! Lonely Planet said that you could reach the top in about 2 hours, and then I figured it would take another hour or so to get back down. Including another half an hour of driving to reach the hosteria, it meant we’d really have to leg it up. 10 minutes in, I was already starting to lag behind and had to take stops to catch my breath. I didn’t think I could make it up there and back in time, so we regretfully called off the summit attempt. It sucked, but that’s life, isn’t it? Sometimes you just can’t do it all. And maybe there’ll be a next time. My advice? If you’re aiming to climb Fuya Fuya, go as early as possible and make sure you have enough time. It gets cloudy and sometimes even rains in the afternoon. 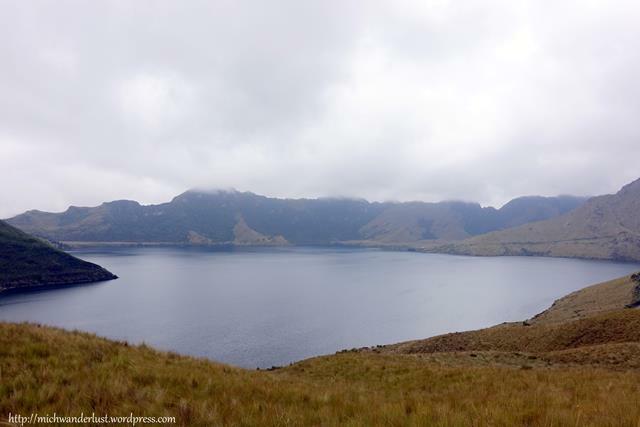 Check out Beauty of Adventure for a successful Fuya Fuya climb! Despite the failed summit attempt, our visit wasn’t a complete bust. 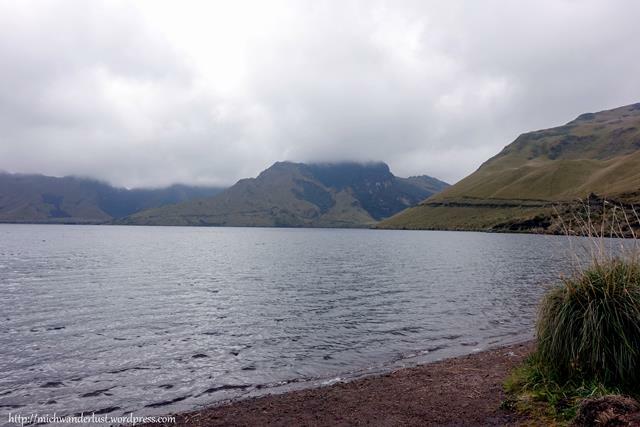 We walked along the main path for a bit and managed to see the “black lake” (Laguna Negra) from afar. These lakes are really big; you’ll need more than a couple of hours if you want to see them all on foot. 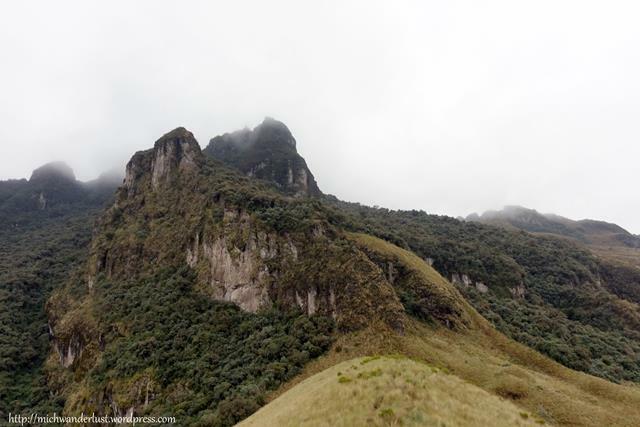 Don’t attempt the climb up Fuya Fuya if you’ve just arrived from a much lower altitude. 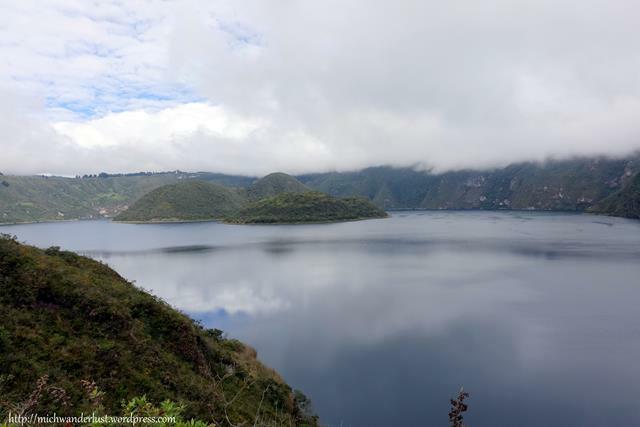 Give yourself some time to acclimatise in Otavalo, Quito, or elsewhere in the Andes. Wrap up well! Layers work best, so you can peel them off if you start feeling hot from all the exercise. Bring rain gear just in case it rains. If you come in the rainy season, as we did (around October to May), waterproof shoes are a must and rubber boots are a good idea. It can get quite muddy! Also note that the rainy season is getting increasingly unpredictable due to climate change. Plan to spend at least a couple of hours there. If you get hungry and haven’t got any food, don’t panic – there are some food stalls near the entrance! You can’t miss it when you drive in. Adhere to the “leave nothing behind” policy – any non-biodegradable waste (plastic food wrappers, etc.) should be taken with you when you leave. It’s really sad to see bits of litter ruining the otherwise pristine landscape. Fun fact: did you know that banana skins take two years to biodegrade? So take them with you too. 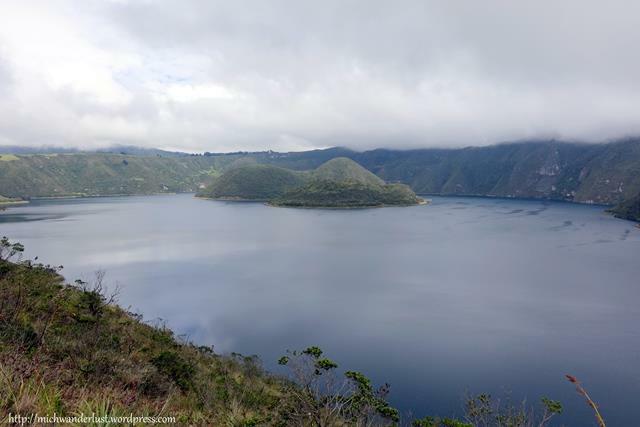 The Cuicocha lake is one of the most popular day-trips from Otavalo. It’s about half an hour by taxi from Otavalo. 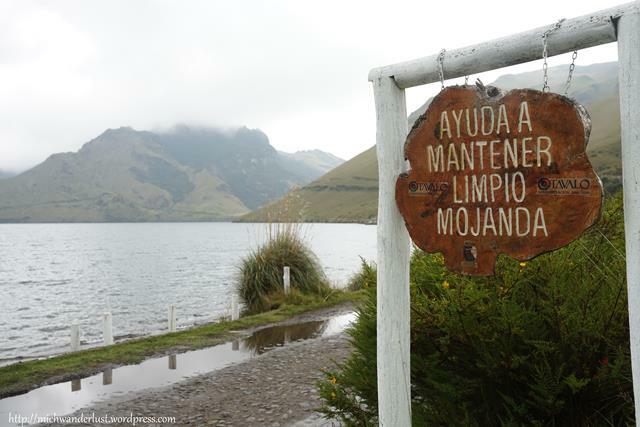 If you want to save a bit of money, you can take a bus to Quiroga (the nearest town) and then take a taxi to the lake. 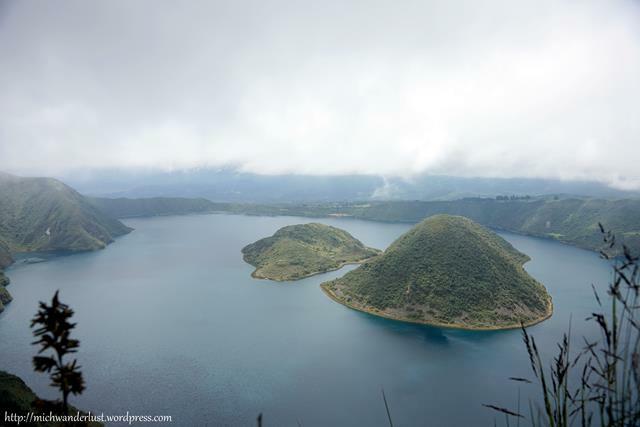 This volanic crater lake is characterised by the 2 islands in the middle. They apparently look like guinea pigs (cuy in Kichwa), hence the name Cuicocha. There are any number of legends about the origin of the lake. According to my host family, it was once a fertile valley owned by a very prosperous man. However, he was also very evil and selfish. God saw this and asked him to do something (I can’t remember what it was!) but he refused, and as punishment God flooded the entire valley so that it became a lake. You can hike around the rim of the crater – there’s a well-marked trail. It’s 14km long and the sign says it should take about 5 hours. However, we were (again) without the luxury of time as our guides had to be back at the hosteria by 1pm. Our original plan was to walk along the trail for a bit and turn back in an hour. But when that hour was up, they asked if we wanted to complete the trail since we were “near the mid-point” (or so they thought). We said, “Sure!” without a second thought, which may have been a mistake. As it turns out, we were more like only 1/4 down the trail. We spent the next few hours hustling as if our lives depended on it, up and down some pretty steep slopes, and only stopping to take a few photos. I’d thought I was reasonably fit after so many months living in Intag and walking everywhere. This illusion was shattered that day. We completed the trail in 4 hours, which just might be a record (for non-crazy-fit people). It was a mad rush, and at times I just wanted to give up, but at that point there was really no way out but up. At least we finished it, and with a sense of achievement – I was really surprised that we did in 4 hours when it’s supposed to take 5. However, we didn’t make it back to the hosteria on time. Oops! For much of the trail you can’t actually see the lake, but there’s plenty of other things to see. 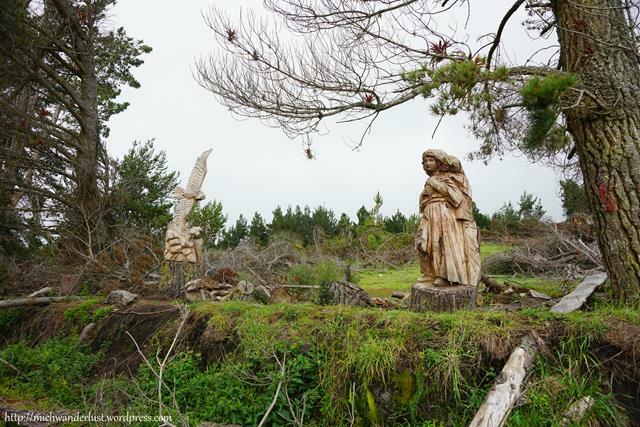 For example, we walked through this little clearing with these seemingly random statues in the middle. If hiking isn’t your cup of tea, you can also take a boat out on the lake. It should be far more relaxing! There are food and souvenir stalls near the main entrance, so don’t worry about food. Rain gear. Always a good idea. As are rubber boots (during the rainy season). 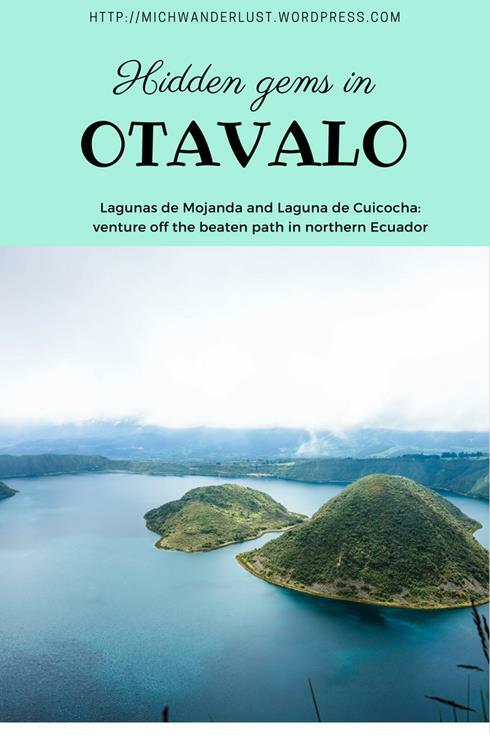 Looking for more things to do in Otavalo? Check out my list of 15 things to do there! Do you like hiking? What was your craziest hiking experience? I love your blog actually, amiguita! It’s sooo funny and such an entertaining read. I think only latino/as can pull off writing like that :p Please please keep it up! And thanks for the reminder that it’s ok to loosen up a bit and throw in some foreign words 😀 Duly noted! I’ve done a bit of trekking and wish on one occasion in particular we had’ve had a bloggers honest opinion about the track rather than the published information we read. I know how important your hints and comments will be for anyone wanting to experience what you did.